In an age of electronic entertainment and plugged-in play, many classic childhood games are being pushed aside. However, these classic games provide key benefits for child development. In this series of posts, we will explore how these “unplugged” activities are more than just child’s play. Swimming is a favorite summertime activity for many families and is one of our most recommended activities for children who seek proprioceptive input. Being in the water provides uniform deep pressure input over large areas of the body which many children find to be organizing. Jumping into the water provides a great opportunity for more intense deep pressure and proprioception. Studies have shown that proprioceptive input causes the release of neurochemicals such as serotonin (involved in mood, sleep and appetite) and dopamine (involved in the sleep/wake cycle). Many families at the clinic have reported noticing positive changes in their child’s ability to sit through an evening meal, participate in family activities and transition to bed after a long day of swimming. 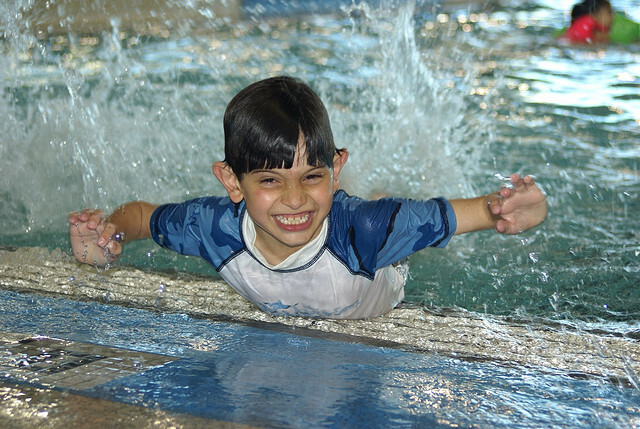 The deep pressure of the water is also helpful to children who struggle with body awareness and motor planning, as the water provides a higher level of feedback than moving oneself on land. All swimming strokes, from simply propelling oneself by kicking to the doggy paddle to formal swim strokes, require efficient bilateral coordination, which is the ability to use the two sides of the body together to complete a larger task. Swimming also addresses strength, endurance and the cardiovascular system. Time to dig out the bathing suits and sunscreen! Time to clear some room on the table and pull out a set of Memory cards. Perhaps the most evident skill this game addresses is visual memory, the ability to mentally store information in order to retrieve it for later recall. Other visual perceptual skills practiced include discrimination (recognizing the image, matching images and categorization of the images) and tracking (scanning the entire field of cards). Flipping over the cards requires efficient grasp, forearm rotation and release. Children practice turn taking skills and can work on appropriate social interactions by encouraging another player. For a personal touch, print out snapshots of familiar people, places or toys as the memory cards. Dig out that sidewalk chalk! Creating a hopscotch grid requires the child to maintain grasp on a piece of chalk while drawing shapes and numbers. Tossing a bean bag onto the grid addresses force grading, timing and release. 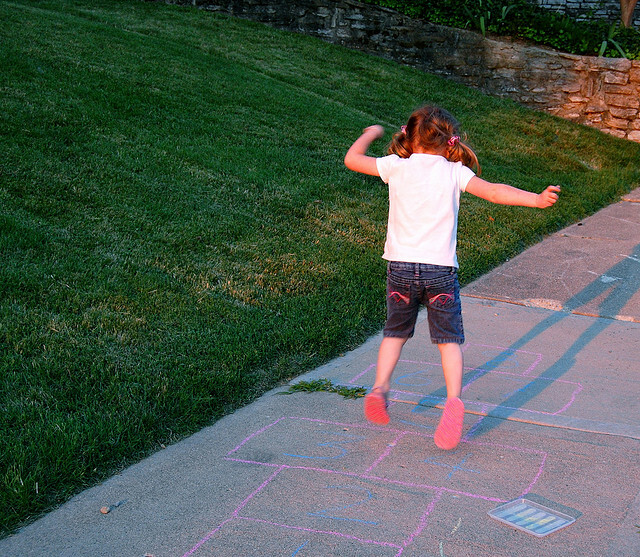 Playing hopscotch encourages development of bilateral coordination skills such as hopping and is a great motivation to improve standing balance on one foot. Ankle reactions and other postural reactions help the child to start and stop moving as they move across the area. The child will receive proprioceptive input and linear vestibular input from jumping. Children who are sensitive to changes in head position may be motivated to tolerate brief periods of head inversion when bending over to pick up the bean bag tossed onto the grid. For children who struggle with acquiring new motor plans, hopscotch provides the opportunity to practice the movements repeatedly in a structured manner until they master the movement. Marco Polo, Sharks and Minnows, Blob Tag, Freeze Tag or just plain old Tag, we’ve all played it. But did you realize the many benefits of this category of games? 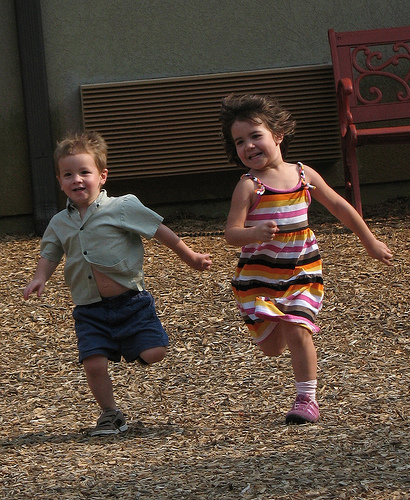 Children playing tag are receiving proprioceptive feedback from their muscles and joints as they run, as well as vestibular input from the movement and changing of direction. Sensory input that is controlled by the child is typically more readily processed than movement imposed by another person. Studies have shown that proprioceptive input causes the release of neurochemicals such as serotonin (involved in mood, sleep and appetite) and dopamine (involved in the sleep/wake cycle). Tag provides a natural motivation to challenge one’s endurance, an area in which many of our clients at the clinic demonstrate difficulty. Balance and coordination are required to make fast changes in direction and the visual system must fluidly track the movement of other players. Social reciprocity skills are also practiced as children take turns being “It”. Time to lace up those sneakers!